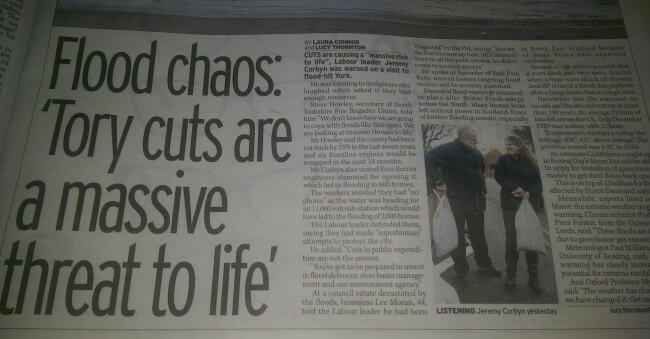 How did the tabloids report on Labour Party leader Jeremy Corbyn’s trip to flood-hit York? Odd that such a big story should be buried on Page 19. Is Corbyn someone the Labour-supporting Mirror wants to hide? A photo of Corbyn talking to a smiling local is captioned “listening”. Corbyn “finally” paid a visit to York. He made a “half-hearted attempt to help. He moved a sandbag “with one hand tucked away in his pocket… But local Labour MP Rachel Maskell used both hand to move hers”. Conclusions: Corby has one strong arm – the other arm weaker than Tom Watson’s willpower in a fudge factory. Maskell is on-message. At a rate of one sandbag per person, MPs are not big on physical activity. “Residents…slammed Jeremy Corby for arriving ‘too late'”. For what? Christmas?